And they’ve got to eat and shop somewhere…. 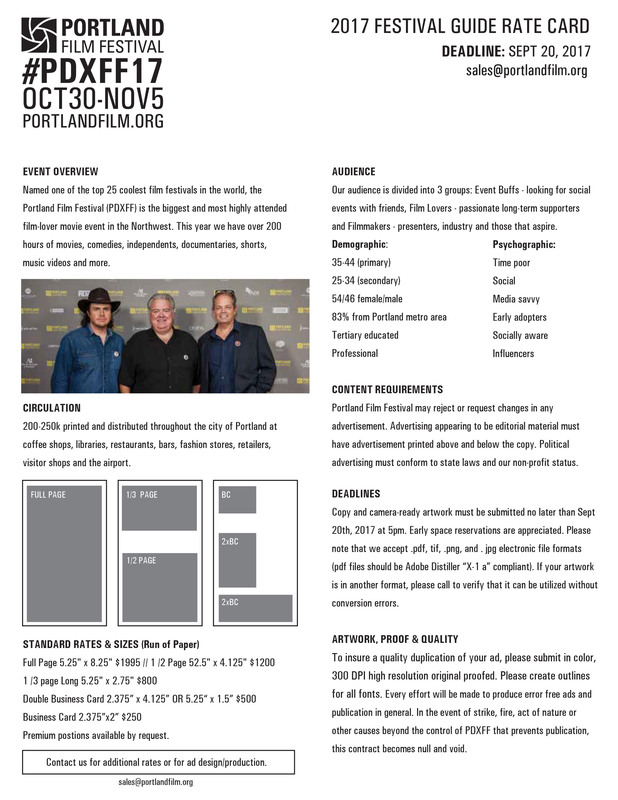 Over 250k full-color Portland Film Festival programs will be printed in October and distributed throughout Portland and to audience members, filmmakers, sponsors and VIPs at the festival. The program is used as a constant reference in the lead-up to and during the festival. It provides the film schedule and detailed information on galas, films, special events, parties and panels. How can your business reach these movie fans? Purchase an ad in PDXFF’s catalogue and it will be distributed widely through the larger Portland community! CIRCULATION: 250,000 copies of the full-color PDXFF community. DISTRIBUTION: The larger Portland and surrounding community, all PDXFF patrons, filmmakers, jurors, VIPs, sponsors and other festival guests. Ad sales for the 2017 Program is still open. For more information, contact us and learn about putting your business in front of our festival attendees. Don’t miss this opportunity to be part of something extraordinary.